Background/Purpose: Synovial tissue from patients with OA often demonstrates inflammation. We hypothesized that a single intraarticular (IA) injection of an anti-TNF drug would decrease inflammatory cell infiltration (primary outcome) and ultimately reduce articular injury. These data were drawn from the infliximab (IFX) group, part of a larger study presented previously (ACR Ann Mtg, Chicago 2011; EULAR Ann Mtg, Berlin 2012). The results noted below represent new findings. Methods: The original pilot study was a single center, 2:1:1 (IFX:MP:P) randomization, double-blind, placebo-controlled IA treatment of knee OA: infliximab (IFX) 100 mg, methylprednisolone (MP) 80 mg or saline (P) on Day 0. Subjects (n=16) had to have knee pain and show minimal to moderate OA on knee radiographs. Demographics for IFX group: Age 54 (IQR 44-62) Race AA/C=3/5; Gender F/M=5/3; BMI 28.9 (IQR 23.1-31.4). Closed needle synovial biopsies and PBMCs for flow cytometry were obtained on Days 0 and 28. Total WOMAC scores and blood samples were obtained on Days 0, 14, 28 and 56. MRI of the target knee was obtained before Day 0. Statistics: nonparametric Wilcoxon test and Spearman correlation coefficient. Results: Total WOMAC score improved significantly only for Group IFX, comparing baseline (BL) to Day 56 (p<0.05). The BL total WOMAC scores were greater in the high vs low cellularity subgroups. 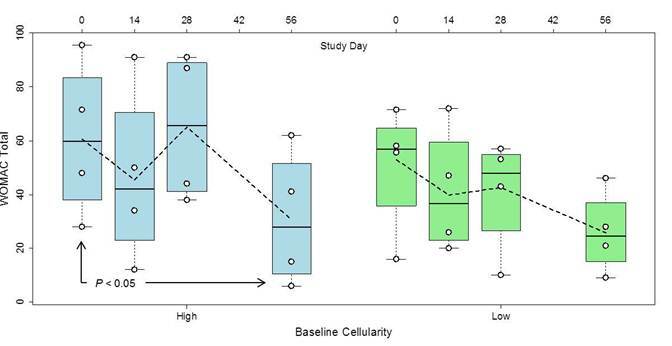 When comparing subjects with high vs low cellularity (4 each), significant improvement (p<0.05) occurred only in the high cellularity subgroup (See Fig). The high cellularity subgroup had higher scores (p<0.02) for inflammatory intensity, mononuclear cells (CD68+ cells, CD3+ cells), blood vessels, Cox-2 expression and IL-1β expression. 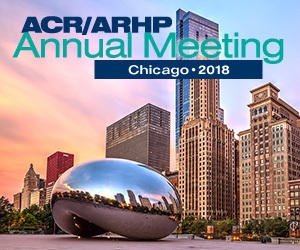 No significant baseline differences between the high and low subgroups were noted for synovial TNFα, IL-6, IL-17, or CD54+ cells, or serum levels of CRP, SAA, IL-6, TNFα, MMP-3 or COMP. BL PBMC biomarkers were compared for differences between high and low cellularity subgroups; two cell subsets trended higher (p=0.097) in the high cellularity subgroup: B cells and low-MFI CD14 CXCR3 monocytes. Higher BL Total WOMAC scores correlated with lower CD14 MFI (p=0.067, R=-0.67); no such correlation was noted with TNFα, MMP-3 or COMP. Circulating levels of IFX peaked at Day 4 with a Cmax of 6.1 ug/ml in 6 subjects; two subjects with detectable anti-IFX Ab had a lower Cmax of 1.6 ug/ml; Cmax did not differ between the two subgroups (5.5 vs 4.3 ug/ml). Conclusion: BL characteristics of the subjects responsive to IA anti-TNF therapy included those with higher WOMAC scores, more abnormal cartilage MRI scores at the lateral compartment, and higher levels of inflammatory cells, including T lymphocytes and macrophages, as well as more blood vessels, Cox 2 and IL-1β expression. In subjects with higher WOMAC scores and higher levels of synovial inflammation IA IFX offers promise as a symptomatic intervention.